Trees can add a great deal of splendour to a garden. They could be fruit bearing trees, a place in which to retreat to the shade and they can also add a great deal of colour to a garden. However, they can also cause a nuisance to a next door neighbour when they start encroaching onto your side of the fence, with problems ranging from attracting unwanted insects like bees and wasps, blocking out your light and shedding their leaves all over your garden. Therefore, it’s important to know what your rights are and what you can and cannot do. The tree belongs to the person upon whose land it has originally grown. Even if its branches or, worse still, its roots have begun to grow over or into a neighbour’s territory, it belongs to the landowner where the tree was originally planted. Even if the tree bears fruit or flowers on branches which overhang into your land, it’s an offence under the Theft Act 1968 to keep them or to take cuttings of flowers, for example. Obviously, many neighbours will not tend to worry about that too much but should a neighbour, for example, see you collecting apples from their tree even though the branches have grown onto your side, they are legally entitled to ask you to return them. 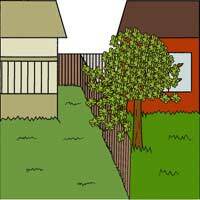 If the branches of a neighbour’s tree start to grow over to your side, you can cut them back to the boundary point between you and your neighbour’s property, as long as the tree is not under a tree preservation order. If it is, you’ll need to seek further clarification. However, the branches and any fruit on them which you may have cut down on your side still belong to the tree owner so they can ask you to return them. It's a bit of an anomaly really, as while you are obliged to offer the branches back, if any leaves from your neighbour’s tree fall into your garden in autumn, you have no right to ask them to come around and sweep them up. 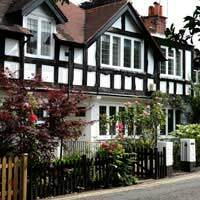 On the other hand, should the trees be causing SIGNIFICANT damage to your gutters (not just blocking them) you can ask your neighbour to pay to have them cleared or to pay for the cost of any damage they might have caused. If they refuse to do so, you can legally sue them and force them into paying. 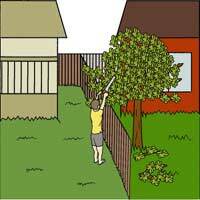 If you lop off any branches on your neighbour’s (the tree owner) side of the fence, you are not entitled to Gain Access To Their Property to cut off some more. This is trespassing and you could be prosecuted. You are entitled to dig up and remove any roots that have encroached upon your land. Roots can cause a lot of problems and if they’re deep and/or causing subsidence or any other form of damage to your side of the property, you might need to get a tree surgeon or some other kind of structural engineer to deal with the problem. It’s always better to discuss this with your neighbour first but if an expert does have to be called in, it’s the tree owner’s responsibility to foot the bill. They can then choose to pay up front or by claiming it against their own home insurance policy. I own the land around my home and the back of two others in the terrace. They have rights to cross to bins and their own gardens. I want to dig up some areas to lay drains from a garden room in my garden. How much notice must I give. I am aware that I must maintain safety. My neighbor cut a bunch of branches off of his tree and left all of them on my side of the fence. Am I responsible for removing the branches? I live in council property tree in the garden has fell on neighbours fence and damaged private tenant fence who is responsible to pay to renew fence. You recently stated that people are responsible for the fencing on the right hand side of the property, not true..I have seen a solicitor with the deeds of my property and it states shared...having bad problems with new neighbour on that side as I have during the years replaced panels on both sides and rear..now the concrete stumps have cracked and not holding panels. I have offered to go half ,even went as far as say I would buy them if he would put them in..no joy...any suggestions please. Hi everyone almost month ago one company cut my tree from front garden i paid £500 included they take away the trees they cut.They said needs to be dry will get in 2 weeks which is pass already they not pick up phones or not respond my sms.What i have to do legaly? My issue is a Madrona rooted in my neighbors yard but the entire tree hangs over my yard and potentially could crush the whole kitchen at my house am I allowed to cut that tree down at the property line it would be at least 3/4 of the tree? My neighbour has a huge sycamore tree which overhangs our car park. The sap and bird droppings are causing significant damage to the cars of several of us in the building. Our managing agents have contacted the owner of the tree and have asked them to top and cut back the tree which has to be about 50ft tall. They were contacted about a month ago and still haven’t responded. Is there anything else we can do? A neighbour has two very large trees that overhang the retained land managed by our Residents Association and bend onto the roof of one if the individual house owners. Those running the Residents Association have not arranged any gardening in this part of the commonly held gardens for many years.The house owner has now asked the Residents Association to pay for the cutting back of these trees (which will need to be done from the owners garden). The Residents Association are saying it is not their responsibility and the house owner must pay the cost themselves. Is this correct?Can the house owner go back to the original neighbour boundary or must they only cut to the boundary between their property and the Residents' Association's boundary by them? Who should bear the cost? My neighbour has removed a whole corner of my beech tree. Yes, it did overhang their garden but all the trees in my garden have TPOs. The land where the houses were built was originally a large farm and the developers tried to put fences where they could without ‘cutting’ trees in half. We originally had 11 trees but over the years storms and disease have meant we have had to remove some, with council permission where necessary. The tree looks very strange now. We can only think he did the work when my husband seriously ill in hospital for three weeks. We only have evidence of when he previously removed some branches. He has threatened us in the past, neighbours the other side moved out because of his behaviour, so what do we do? Do we put up with a badly damaged tree and keep quiet or report him to the council? We hired an arborist to trim our backyard tree at the request of a neighbour. The branches extended over into two yards. The arborist gave us a quote splitting the costs between neighbours with us paying 50% of the service the other two sharing 50%. Now one neighbour is refusing to contribute even though they were happy with the service. I would like to know what is the general rule about overhanging branches which are not causing damage and how a bill is managed thank you. Neighbour has cut my over hanging branches at the back of my property( not on there property), it belongs to the water board , in July this year they cut some branches where they were over hanging onto there's but came into my boundary by approximately 18 inches. Do I have a case ?? I have a alleyway behind my garden, it doesn't lead to anywhere. Then you have houses behind my garden. There are 2 overgrown fit trees which are blocking sunlight in my south facing garden. These trees are effectingmy neighbours garden and two doors away as well. We have spoken to them and they have refused to do anything about it. I have got in contact with my local council if they can tell me if they can tell me if it's a council house or it's privately owned, they said they can't do that as it's a data protection act. So what we could do now. I have tall trees bordering my garden.On one side is a single track road with my neighbour's property alongside it.He wants me to cut down or severely reduce these trees as leaves block his gutters and gather in his yard. He says there are overhanging branches but I 've not noticed these. We have been here for 30 years and our neighbour only 4. We made it clear before they moved in that we love our trees and won't take any down unless they are dangerous. They do not block light. If he takes this further , has he a right to legal action? My neighbour moans as us when the bin men leave our bins by her garage before we have the chance to move them . She is a barrister so will understand the law better than us but she has vegetation encroaching rapidly into our garden and a rapidly growing fig tree that is taking over her garden . My concern is she doesn’t keep the garden maintained , what am I able to ask her do before they become a problem ? We have an established holly tree ( which is beautiful and full of wildlife) that is planted in our garden but over the years (prob about 30) the trunk has bended and drifts over our neighbours boundary and then back into our garden. The current fence has been erected to account for the tree trunk.As the fence is wearing the neighbours would like to replace with a higher fence and want all the tree cutting right back to the boundary And have sent us a copy of some legal advice they have been given saying we are trepassing by the tree being across the boundary and going to court if we don't cut it back will cost circa (20k!). ( we know the email has come from a lawyer friend of there's so is by no means official) I'am reading lots about common law and that neighbours can cut Back branches and trunk back to the boundary but as the tree owners, do we have to do it if requested?We have tried to be amicable with them but it's turning nasty.We are also in a conservation area so aware we will need permission to prune anyway.Any immediate advice or comments would be welcome please. You have a common law right to cut back tree branches that overhang onto your property. The law states that any branches cut off belong to the person on whose land the tree originally grew, so you should ask your neighbour if they want them back, or if they are happy for you to dispose of them. Do not just throw trimmings back over the boundary - this could constitute 'fly tipping'. Ask your neighbour whether they would like any trimmings back. Equally any fruit on trees, even if they are growing on branches which overhang your property, still belongs to your neighbour. You are therefore stealing if you pick these for yourself without your neighbours' permission. We have our neighbours Apple tree branches hanging over over our chalet they are hanging over about 5ft on the roof causing damp when it rains . We have been told by a housing officer we have to pay a tree surgeon to cut the branches our side and and pay them to take them away .We live in a privately owned property .